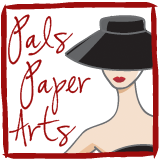 The Madonna song, "Holiday" comes to mind with the title of this week's Pals Paper Arts Challenge! I could not decide which holiday I was going to design a card for, but I think this is perfect invitation for a New Year's Eve party. I grabbed a sample piece of Basic Black card stock that I first tried out my new Snowburst Embossing Folder out with a few weeks ago. I also had already shimmered it up using a Sponge Dauber and Champagne Mist Shimmer Paint. This was the inspiration for my card! Add *bling* with a Basic Rhinestone to dot the "i"
I hope you enjoyed looking! Don't forget about the current Stampin' Up! promotions outlined here. I would love to have you join my stamping group--order your Starter Kit by Friday, November 11th to take advantage of the latest promotion. Please leave your comments below, as I do love to read each one. The shimmery snowflakes are wonderful! And that gold skirt definitely says C'mon let's party! Your gold layer is perfect for a New Year's Eve card ... love this, Patti! Great texture and shine! Oh La La, this is gorgeous. Great job, Patti! Love the gold paper. I never know how to use that stuff, but you did it beautifully! Beautiful, Patti! I love that champagne shimmer! I love your invitation, Patti! The embossed background looks gorgeous "shimmered" with Champagne Mist! Neat way to use the waffle paper, too!